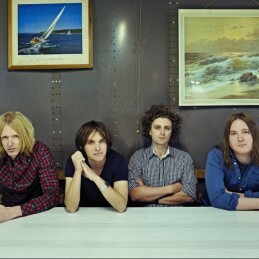 British India emerged from the Melbourne underground scene in 2007 to become one of Australia’s most successful independent rock acts in recent times. With 4 Top 10 albums to their credit the band show no signs of slowing down with their new album ‘Forgetting The Future’ Liberation /Anti Fragile 2017. The way Declan Melia tells it, British India had to destroy their world in order to live in it. After five successful albums, the Melbourne four-piece found themselves at a crossroads. They could continue to explore the afternoon guitar contemplations of 2015’s Nothing Touches Me, which debuted, as with their previous three albums, in the Top 5 of the ARIA Albums Chart. Or they could blow it all up and start from nought. Forgetting The Future is the explosive sixth record from one of Australia’s most cherished and esteemed rock bands, produced by Oscar Dawson. Before reaching for the reset button, however, Melia had to weather a crisis of faith. Early in 2016, when talk of writing another album began, the guitarist and vocalist was questioning where the band were heading: weighing up what they had created and what it meant. British India formed when all four members – Melia, guitarist Nic Wilson, bassist Will Drummond and drummer Matt O’Gorman – were 16 and in high school. Together they’ve seen no less than eight of their songs voted into the triple j Hottest 100, had their ‘I Can Make You Love Me’ single certified Gold, played every festival from Byron Bay to WA, toured, toured and toured again. As the band turned the corner into its 10th year since their debut album ‘Guillotine’ 2007, the music world looked different. Melia wasn’t sure where British India fitted or what he wanted to say. The answer to Melia’s question was a collective “yes”, so as the premise for writing was set, the band rented the front room of Sing Sing Recording Studios in Melbourne’s south and settled in. No time constraints, no limitations – and then, with the band together again in a room, the writing flowed quickly. They recorded demos as they wrote, turning out riffs and ideas for no less than eight months before Oscar Dawson stepped in to work with them on turning the unbridled ideas into a record. During that time, Melia realised that his own struggles mirrored those of the world at large – or, as he puts it, “the whole world seems to be having a crisis of faith” – and so he began to write, his lyrics taking on a “micro-verses-macro form: me thinking about my own life, then weighing that up against everything else that’s going on”. The first single ‘Precious’ is perhaps the most clear example of Melia writing away his uncertainty, the front man yearning to accept the brevity of life and that each scene of beauty should be valued. Another standout track is ‘Absolutely Disgusting’, one of the album’s few tender moments, which sees Melia exploring starkly honest relationship failings. Front and centre of the album is British India’s signature melodic chaos, more unhinged than ever in the frenetic yet danceable rhythms of ‘Midnight Homie’ and ‘My Love’. ‘My Love’ was the first song fully completed for the record, and when the band gathered around the studio speakers to listen, they knew they were making the album they needed to make.